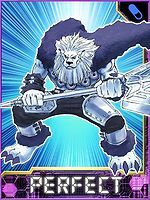 Called the "Cool-headed White Lion", it exterminates those devoted to evil for the sake of justice, and it's starting to be said that those battles are unparalleled in their ruthlessness. 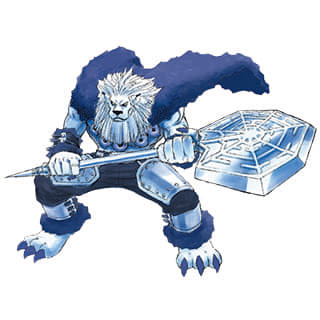 Its "Yuki Hanabi", an axe said to be cut from ore of the legendary rare metal, "Mithril", holds the power to easily pulverize the permanently frozen icebergs which hinder its path like a series of skyscrapers. 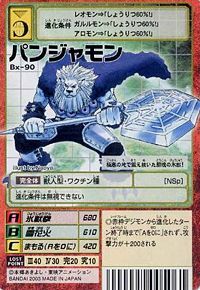 Title: 「冷徹なる白獅子」 — "Cool-headed White Lion"
From Panja the White Lion, a character in the series Jungle Emperor (ジャングル大帝 Janguru Taitei). Hyoujūken  Ice Beast Fist 氷獣拳 N/A Gathers the power of cold air in its right hand and shoots a blast of cold air in the shape of a lion's head that freezes the foe. ↑ The "雪花" from yukihanabi can be translated as "Snowflake" (雪花, Sekka). This page was last modified on 28 October 2018, at 10:04.